Chaplains seek to address moral and spiritual dimensions of those in their care. Navigating an explicit patient request that may be in tension with the chaplain?s spiritual assessment may provide opportunity for an alternative approach and interdisciplinary collaboration. The case study for this webinar reports use of ritual with a Dutch military veteran who suffers traumatization. The chaplain seeks to differentiate between the ritual the patient carried out in creative therapy and the religious ritual the patient requests of the chaplain, considering how each may contribute uniquely to veteran?s healing and sense of meaning. More broadly, the Dutch Case Studies Project in Chaplaincy Care is making an important contribution to chaplaincy as an alternative method in chaplaincy research. 1. To become familiar with the use of religious ritual in a behavioral health unit to address past trauma. 2. To examine patient preferences in regard to these concepts as practiced by providers and interdisciplinary approaches. 3. 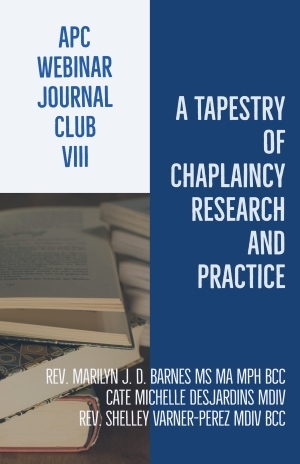 To help chaplains develop and maintain research literacy, including the ability to critically read a case study, identify the structure of a case study for publication and, where appropriate, apply the findings to their professional practice. Reading: Van Loenen, G, J K?rver, M Walton, and R De Vries. "Case Study ?Moral Injury?. Format Dutch Case Studies Project." Health and Social Care Chaplaincy (2017): 281-96. Optional Background about the Dutch Case Studies Project: Walton, Martin, and Jacques K?rver. "Dutch Case Studies Project in Chaplaincy Care. A description and theoretical explanation of the format and procedures." 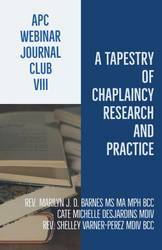 Health and Social Care Chaplaincy (2017): 257-80. Rev. Marilyn J. D. Barnes MS, MA, MPH, BCC, is a Senior Staff Chaplain at Advocate Lutheran General Hospital in Illinois. She is a Transforming Chaplaincy Fellow who recently completed her Master?s in Public Health with a concentration in Epidemiology. Her research interests include the use of simulation in chaplaincy training and education and the impact of spiritual/religious coping on the association between discrimination and stress among midlife women. Cate Michelle Desjardins MDiv is a chaplain fellow at Cincinnati Children?s Hospital Medical Center in Cincinnati, OH and Transforming Chaplain Fellow. She is completing her MPH degree at University of Cincinnati College of Medicine. Her research is focused on pediatric complex care, medical decision making, and religious coping. Rev. Shelley Varner-Perez MDiv BCC, is a Clinical Staff Chaplain at VA Portland Health Care System in Portland, Oregon, and a Transforming Chaplaincy Fellow. She is completing her MPH degree at the joint School of Public Health at Oregon Health & Science University and Portland State University. Shelley is the past Education Chair of the APC-Oregon North Chapter.